Since arriving in London one word keeps coming to mind when searching to describe taste in this legendary city; and that is texture. The architecture of London, the weather and what its inhabitants wear, all hold in common an elegant grit. Tweet suits, quilted jackets, knitted cardigans, corduroy pants, rubber boots, wax cottons and of course checks, fill the traditional British fashion landscape. A language of layered patterns; texture on textures. Visually this is akin to the experience of entering an exotic carpet store, where decorative rugs line the walls and gather on the floors. In London's Piccadilly the iconic store Essie trades in the finest of such objects, and it was in this environment that Paul Smith chose to preview The British Collection during the current London Collections: Men AW 2014. 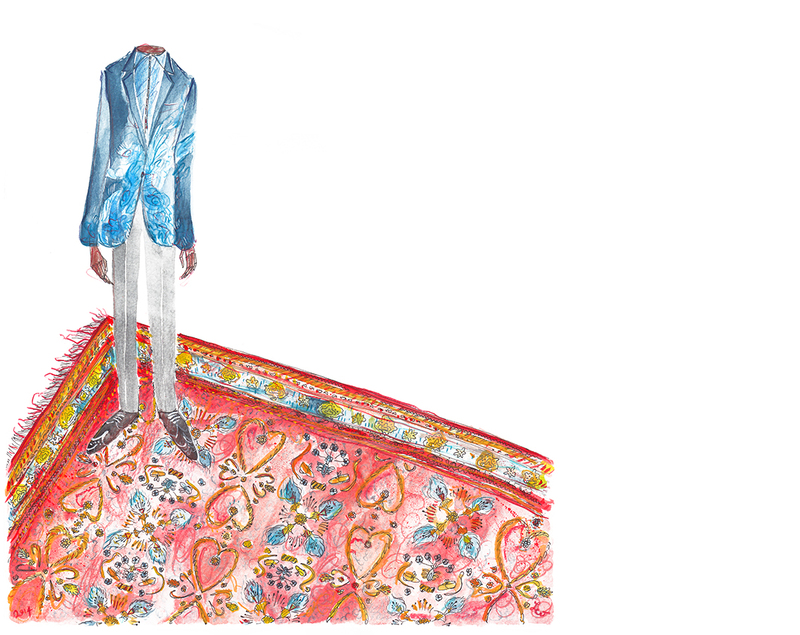 Intermingled with the hypnotic carpets and rugs Paul Smith displayed on wooden mannequins a collection that embellishes and enhances traditional British ideals through the luxury of layering textures. Glen Checks, often referred to as The Prince of Wales Check, morphed over jackets, vests and pants, while business shirts we re-made in a soft chambray. Overcoats seemed even more protective in dark quilted denims, while scarfs and handkerchiefs reflected the gold and burgundy ogees in the surrounding lavish rugs. Paul Smith's innovations on this British uniform are thanks to the brand’s keen relationship with the Clissold Mill of Yorkshire. Through this partnership contemporary design has joined forces with age old craftsmanship to rejuvenate tradition, producing new ways to weave cloth and imagination into dressing.